Proper identification of individuals is crucial for acknowledging and studying their scientific work, be it journal articles or pieces of software. In this tech note, one year after CRAN started supporting ORCIDs, we shall explain why and how to use unique author identifiers in DESCRIPTION files. Why use ORCIDs on CRAN? When analyzing the authorship of CRAN packages, one can look at authors’ names and email addresses. Names can be written with and without quotes, email addresses change, which makes it all tricky as noted by David Smith when he looked for the most prolific CRAN authors (notice our very own Scott Chamberlain and Jeroen Ooms in that scoreboard by the way?). Besides, several people can have the same name! So all in all, using an unique ID per author makes sense. That’s something offered for the academic world and beyond by ORCID, ORCID meaning “Open Researcher and Contributor ID”. Anyone can set up an ORCID account for free and link it up to the rest of their online persona, as well as to their employment and works. When the authors of a scientific paper give their ORCID ID to the publisher, these can be included in the html and PDF versions of a paper. Note that there’s no, say, Keybase verification for ORCIDs, and often the input of an ORCID ID for a paper is declarative as well. Read more about ORCID here. About one year ago, CRAN added support for ORCID in DESCRIPTION files by a minimally invasive hack. One can add the ORCID ID of an author as a comment field in person(), see e.g. Carl Boettiger’s ID in codemetar DESCRIPTION, and one gets a nice little green bubble near their name on CRAN, see e.g. codemetar CRAN page. Unique identifiers for free! Sure, there’s no verification so someone could use your identity, but at least, it should help assigning your own work to you. Clickable name on CRAN pages, METACRAN pages and pkgdown websites! E.g. when clicking on Carl’s green bubble on codemetar CRAN page, one gets to his ORCID profile including a link to his personal website. See also codemetar METACRAN page and codemetar pkgdown website. Even for non academics, making one’s online persona more accessible from a CRAN DESCRIPTION can’t hurt. How to manipulate ORCIDs in DESCRIPTION? 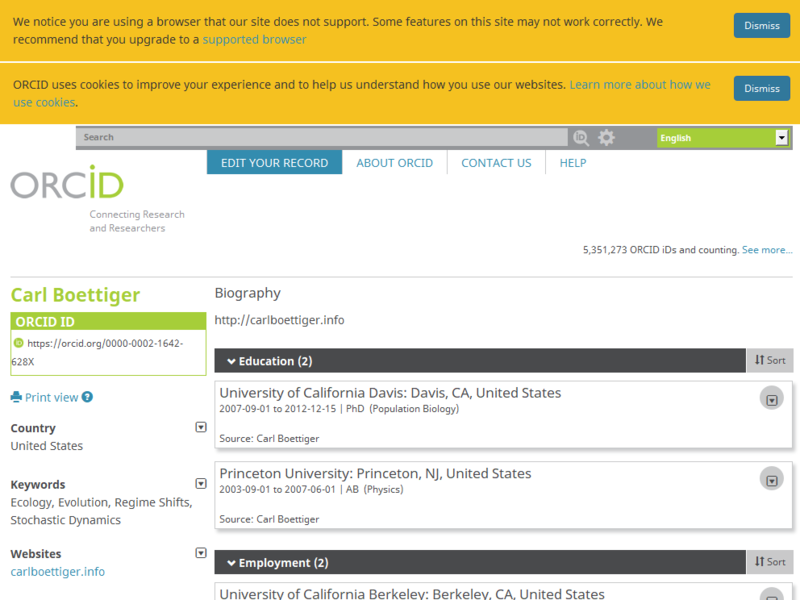 So, how does one add add and interact with ORCID in DESCRIPTION? Well, thankfully, the current dev version of the RStudio desc package by Gábor Csárdi has some direct support of ORCIDs! Gábor too is well ranked in the scoreboard mentioned earlier! Obviously this very example above has probably little real-life applicability, but you could imagine manipulating DESCRIPTION files en masse using a table of ORCIDs and new roles. and there are two Maëlle’s, the function will error and you’ll need to run it with more specific arguments. Add all of your identity at once! install the whoami package necessary for desc::desc_add_me() to work. install.packages("whoami"). desc::desc_add_me() looks for your name and email addresses in your existing configuration (git configuration, GitHub profile), see the whoami package docs. So say you’ve just been told to add yourself as contributor of a package you’ve improved: inside the package directory, you’d just need to run desc::desc_add_me() and voilà ! No risk to wrongly copy-paste your ORCID. As a conclusion of this section, not only are ORCIDs useful, but they’re getting citizen status in the world of as-automatic-as-possible package development. Now, we shall see how one could use ORCIDs inside R to gather information about package authors. 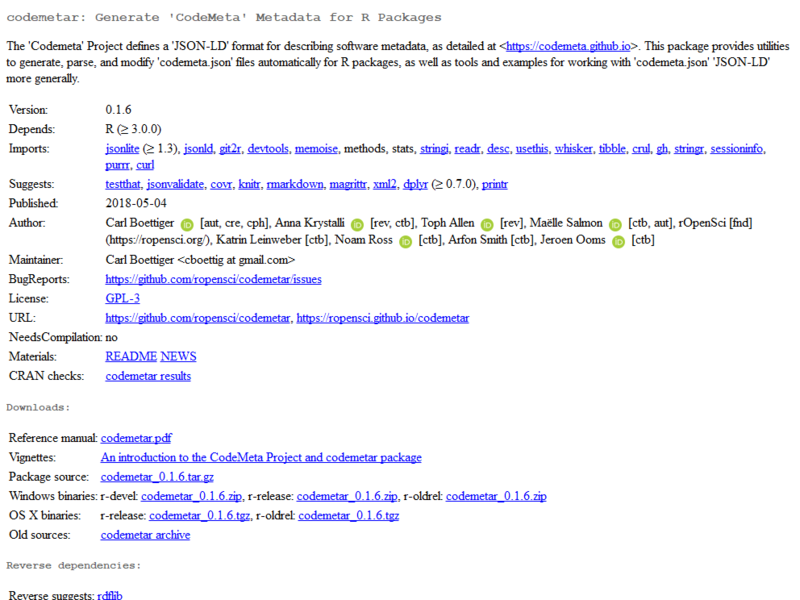 As mentioned earlier, rOpenSci’s Scott Chamberlain is the most prolific CRAN package maintainer, so perhaps unsurprisingly, he maintains a package interacting with ORCID’s API, rorcid! and to save the resulting token as an ORCID_TOKEN environment variable in .Renviron (again, usethis::edit_r_environ() can help with that). Authentication warrants your having an ORCID account, so if you haven’t one yet, register via this link. Then, we’ll query all comment’s of [email protected] of CRAN packages. Some CRAN packages use the Author field instead, which is not recommended and doesn’t allow using comment. Side-note, in general, how would one analyze stuff over the whole CRAN collection? Some information can be found in tools::CRAN_package_db() as seen in this recent tech note. There’s an official read-only mirror of each all CRAN packages on GitHub thanks to METACRAN. METACRAN serves a CRAN package database, wrapped by an R package of course. One could try setting up a local CRAN mirror. but in our case, when wanting to get all the current CRAN authors, it’s easier to use tools::CRAN_package_db(). As a side-note, if you find a better solution than the functions defined below parse_authors() and parse_author() (some purrr magic?) to coerce all authors information to a data.frame, feel free to comment under the post! This is how the resulting table looks like. Out of 13147 packages on CRAN we are looking at 5421, i.e. packages using the [email protected] field. There is one line per author in a package. We can count the number of occurrences of ORCIDs. Only 613 packages have at least an ORCID ID out of 13147 CRAN packages (you can’t have an ORCID ID without using the [email protected] field). There are 512 unique ORCID IDs. Let’s look at the most prolific authors with an ORCID ID. Then we can use rorcid to get a glimpse of their profile. Interestingly we recognize some names from the most prolific CRAN maintainers (Scott and Jeroen, again!) but not only. Note that another difference with David Smith’s post is that the list above includes authors no matter their role. Over all authors with an ORCID, using rorcid one could extract their location and much more, but this is beyond the scope of this tech note. Other methods to search CRAN by ORCID ID might include using the seer package (not possible yet). In this tech note we made the case for using ORCID IDs as identifiers for the authors of CRAN packages, for academics and non-academics as well. We described the current desc support for ORCID. We also gave a small insight into the wealth of information one can get via rorcid. write a software paper, e.g. via JOSS, that’d have its own DOI. Making CRAN package authors easier to identify and their online persona easier to find. Making academic CRAN package authors’ scientific contributions easier to access when studying packages. Have you started desc::add_orcid()-ing? Don’t hesitate to comment below! Many thanks to 0000-0002-1642-628X and 0000-0003-1419-2405 for their feedback on this note.